Eritrean Petro Mamu hit the front at a super-fast pace and never relinquished first place to win the final edition of the 2014 Skyrunner World Series Skyrace Series at the Limone Extreme Skyrace in 02:14:25. Second place was Kilian Jornet, having done the VK the evening before his legs weren’t as fresh, but he closed in fast on Mamu in the final 10 kilometers and reduced his two-minute lead to 30 seconds by the finish. In third place five minutes behind Jornet was David Schneider. 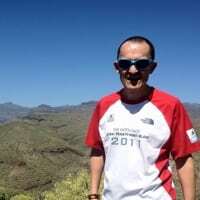 But in some ways it was Jornet’s day, as this sealed the Skyrace Series and his third Skyrunner World Series title for 2014, having already won the VK and Ultra Series. Maite Maiora worked her way steadily from an early fourth place to win in 2:47:05 two-minutes ahead of second-place Stevie Kremer. Third place was Elisa Desco, who fought hard and, literally, hit the deck at the finish. Kremer wraps up the season as the Skyrace Series champion. As usual, we’ll be updating this article with links to Limone Extreme Skyrace-related articles, photo galleries, and race reports. Limone is relatively short in distance at 23.5k, but tough on elevation with 2,000 meters of vertical gain, traversing three mountains, Bocca dei Fortini (1,200 meters), Monte Traversole (1,441 meters), and Coma Vecchia (1,415 meters) before descending back to Limone. With a downpour the night before, humidity was high leaving it warm and sticky for race day with the race starting at 1:30 p.m. outside the line of restaurants, pizzerias, and pleasure-boat docks in Limone Centro. Petro Mamu is not a well-known name, but he came into this race as the 2014 Mountain Running World Cup winner having also placed seventh at the 2014 World Mountain Running Championships last month. Also, he has a marathon PR of 2:25:37 set in his home country in May. So, take heed, this guy has mountain credentials as well as speed. His game plan was to lead from the gun and that is exactly what he did. The first two kilometers suited him as it undulates, but, boy, was he flying when he hit the first climb! By the time 10k had past, he had a two minutes lead on Jornet, Schneider, and Marco De Gasperi. The women’s race appeared to be between Kremer and Laura Orgué as they swapped places between Checkpoint 1 and the 10k point, but Maiora was biding her time in third place. Desco and Limone VK winner Christel Dewalle were lying in fourth and fifth places, respectively. At Monte Traversole (1,441 meters), there is a long and technical descent back to Limone, and it was here that Jornet made up 90 seconds to Mamu who was racing hard to maintain his well-fought lead. Mamu hung on and arrived at the beach to stride his way along amid applause from the crowds and then sprinted along the finishing funnel to hit the winner’s tape. Not once did he look back, but only 30 seconds later Jornet came to join him high-fiving the crowds, enjoying the moment that he had won the Skyrace Series and his third Skyrunner World Series title in one year. This has never been done before and, perhaps, it’s never to be done again. The technical descent from Monte Traversole played an important part in the women’s race. Orgué had dropped down the field and Maiora had worked her way up past Kremer and stretched out her lead to two minutes by the finish. Kremer was not going to give in and toughed it out to take second place ahead of Desco by three minutes. Desco had worked hard all day and by the time she arrived at the finish line, she had nothing left, collapsing to the ground. Mamu is the real deal…at the 2012 Mountain Running Champs (granted it was only a 12km course and not technical) he ran 1:01. For comparison in that race I was way back in 12th place in 1:05, Joe Gray was back in 1:06 and Rob Krar was back in 1:08…just to give you an idea of his relative range. I'm sure he has much better than a 2:25 marathon in him as he was also second at the Jungfrau mountain marathon in 2013…taking down a 2:08 Swiss marathoner. Great to see these really talented guys get into SkyRunning/MUT running. Sage – agreed – Mamu posted a 64 minute half marathon in Innsbruck very recently which suggests a 2:25 PR at marathon is a bit slow! I actually think he could probably run much faster than a 64 min half too…from what i saw at the World Mountain Running Championship he took off like a sub 28min 10km runner…climbing perhaps as well as Jono Wyatt!! I am curious of what happened to Emelie Forsberg because she was sitting third overall in the series. For sure, I had no doubt she was going to be in the top 3 in the overall but she ended up 16th overall. Would have been fascinating to see KJ race with fresh legs. Or for Petro to have done the VK. It would maybe take too much management organization etc., but I wonder how many 2nd tier African marathon runners will try their hand at MUT racing in the next few years. Lower paychecks and recognition, but still must be appealing for some that aren't going to be running sub 2:06 for the marathon.